“In life you need either inspiration or desperation,” declares self-help guru Tony Robbins. Bereft of the former, the liberal group Our Oregon has embraced the latter. The backbone of OFIR’s campaign has been the scores of volunteers who have circulated the petition and worked to gather the 88,000 signatures needed to certify the measure for the ballot. Those volunteers, of whom I am one, are motivated not by “hate” but by patriotism — and by the knowledge that Americans of all races benefit from laws that work to ensure an orderly influx of immigrants to our country. Tens of thousands of rank-and-file Oregonians have been excited to sign the petition and lend their names and support to sanctuary repeal. 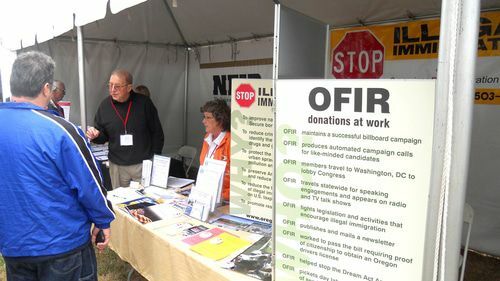 To supplement the volunteers’ work, last year the campaign contracted with a company that employs paid signature gatherers — a small minority of whom, as the Herald and News reported in a recent story (“Investigation targets ‘sanctuary state’ repeal effort,” June 2), may have sought to misrepresent the measure as protecting, not repealing, the sanctuary law. Lee Vasche, the company’s owner, “acknowledged complaints about misrepresentation in general,” the story reported. “Most were the fault of one signature gatherer, Vasche said, adding the company fired two other circulators and destroyed about 400 signatures” that may have been obtained under false pretenses. But Our Oregon now suggests, with no evidence whatever, that Vasche may have known and approved of efforts to misrepresent the measure. Indeed, argues a complaint the group submitted to the state Department of Justice, “it is difficult to imagine a scenario” in which this was not the case. This is baseless conjecture. Many ballot-measure campaigns employ paid signature gatherers. Those employees work on their own absent close supervision. The great majority are scrupulous to represent their measures fairly and accurately. A very few, however, are not. Their indiscretions do not reflect on the veracity of their employers or negate the value of the campaigns with which they are or have been associated. I have worked with Lee Vasche since 2009, when I joined him on OFIR’s board of directors. He has long been one of Oregon’s premier political-marketing professionals. His integrity is beyond reproach. For Our Oregon to allege he was complicit in a strategy to deceive voters besmirches the reputation of an honest man. And it reveals the desperate measures to which the group will resort to keep sanctuary repeal off November’s ballot. As for the measure itself? Oregon’s sanctuary statute forbids Oregon’s police departments and sheriff’s offices to use their resources to detect and apprehend reputedly “noncriminal” illegal immigrants. In doing so, it helps illegal immigrants escape the consequences of their lawbreaking — and encourages even more of them to come here. Repealing the statute would free our police and sheriffs to take the initiative to help enforce immigration law. And it would send the clear message that lawbreakers of any kind will not get a free pass in Oregon’s communities. To help get sanctuary repeal onto the ballot, interested voters should print a single-signature petition (available at StopOregonSanctuaries.org), sign it, and mail it to the campaign’s headquarters by July 2. Richard F. LaMountain is a former vice president of Oregonians for Immigration Reform. In 2014, he was a chief sponsor of the ballot measure via which Oregon voters rejected illegal-immigrant driver cards. Tom Cotton was elected to the U.S. Senate from Arkansas in 2014, following one term in the U.S. House of Representatives. He serves on the Senate Banking Committee, the Senate Intelligence Committee, and the Senate Armed Services Committee. A graduate of Harvard College, he studied government at the Claremont Graduate School and received his J.D. from Harvard Law School in 2002. In 2005, he was commissioned as a 2nd Lieutenant in the U.S. Army, rose to 1st Lieutenant, and served deployments in Iraq with the 101st Airborne and in Afghanistan with a Provincial Reconstruction Team. His military decorations include the Bronze Star Medal, Combat Infantry Badge, and Ranger Tab. The following is adapted from a speech delivered on September 18, 2017, in Washington, D.C., at Hillsdale College’s Eighth Annual Constitution Day Celebration. Last year, for the first time in our nation’s history, the American people elected as president someone with no high government experience—not a senator, not a congressman, not a governor, not a cabinet secretary, not a general. They did this, I believe, because they’ve lost faith in both the competence and the intentions of our governing class—of both parties! Government now takes nearly half of every dollar we earn and bosses us around in every aspect of life, yet can’t deliver basic services well. Our working class—the “forgotten man,” to use the phrase favored by Ronald Reagan and FDR—has seen its wages stagnate, while the four richest counties in America are inside the Washington Beltway. The kids of the working class are those who chiefly fight our seemingly endless wars and police our streets, only to come in for criticism too often from the very elite who sleep under the blanket of security they provide. Donald Trump understood these things, though I should add he didn’t cause them. His victory was more effect than cause of our present discontents. The multiplying failures and arrogance of our governing class are what created the conditions for his victory. Immigration is probably the best example of this. President Trump deviated from Republican orthodoxy on several issues, but immigration was the defining issue in which he broke from the bipartisan conventional wisdom. For years, all Democrats and many Republicans have agreed on the outline of what’s commonly called “comprehensive immigration reform,” which is Washington code for amnesty, mass immigration, and open borders in perpetuity. This approach was embodied most recently in the so-called Gang of Eight bill in 2013. It passed the Senate, but thankfully we killed it in the House, which I consider among my chief accomplishments in Congress so far. Two members of the Gang of Eight ran for my party’s nomination for president last year. Neither won a single statewide primary. Donald Trump denounced the bill, and he won the nomination. Clearly, immigration was an issue of signal importance in the election. That’s because immigration is more than just another issue. It touches upon fundamental questions of citizenship, community, and identity. For too long, a bipartisan, cosmopolitan elite has dismissed the people’s legitimate concerns about these things and put its own interests above the national interest. No one captured this sensibility better than President Obama, when he famously called himself “a citizen of the world.” With that phrase, he revealed a deep misunderstanding of citizenship. After all, “citizen” and “city” share the same Greek root word: citizenship by definition means that you belong to a particular political community. Yet many of our elites share Mr. Obama’s sensibility. They believe that American citizenship—real, actual citizenship—is meaningless, ought not be foreclosed to anyone, and ought not be the basis for distinctions between citizens and foreigners. You might say they think American exceptionalism lies in not making exceptions when it comes to citizenship. This globalist mindset is not only foreign to most Americans. It’s also foreign to the American political tradition. Take the Declaration of Independence. Our cosmopolitan elites love to cite its stirring passages about the rights of mankind when they talk about immigration or refugees. They’re not wrong to do so. Unlike any other country, America is an idea—but it is not only an idea. America is a real, particular place with real borders and real, flesh-and-blood people. And the Declaration tells us it was so from the very beginning. Prior to those stirring passages about “unalienable Rights” and “Nature’s God,” in the Declaration’s very first sentence in fact, the Founders say it has become “necessary for one people to dissolve the political bands” that tie them to another—one people, not all people, not citizens of the world, but actual people who make up actual colonies. The Founders frequently use the words we and us throughout the Declaration to describe that people. Furthermore, on several occasions, the Declaration speaks of “these Colonies” or “these States.” The Founders were concerned about their own circumstances; they owed a duty to their own people who had sent them as representatives to the Second Continental Congress in Philadelphia. They weren’t trying to free South America from Spanish or Portuguese dominion, much as they might have opposed that dominion. Perhaps most notably, the Founders explain towards the end of the Declaration that they had appealed not only to King George for redress, but also to their fellow British citizens, yet those fellow citizens had been “deaf to the voice of justice and of consanguinity.” Consanguinity!—blood ties! That’s pretty much the opposite of being a citizen of the world. So while the Declaration is of course a universal document, it’s also a particular document about one nation and one people. Its signers pledged their lives, their fortunes, and their sacred honor to each other, in English, right here in America—not in Esperanto to mankind in the abstract. The Constitution affirms this concept of American citizenship. It includes only one reference to immigration, where it empowers Congress to establish a “uniform Rule of Naturalization.” It’s worth pondering a couple points here. First, what’s that word uniform doing? The Constitution uses the word only three times, when requiring uniform rules for naturalization, bankruptcies, and taxation. These are things that could either knit our Union together or blow it apart—taxation by the central government, the system of credit upon which the free enterprise system depends, and the meaning of citizenship. On these, the Framers insisted upon a uniform, nationwide standard. Diverse habits and laws are suitable for many things in our continental republic, but not for all things. In particular, we can only have “one people” united by a common understanding of citizenship. Second, the word naturalization implies a process by which foreigners can renounce their former allegiances and become citizens of the United States. They can cast off what accident and force have thrust upon them—race, class, ethnicity—and take on, by reflection and choice, a new title: American. That is a wonderful and beautiful thing, and one of which we are all justly proud. Few Americans love our land so much as the immigrants who’ve escaped the yoke of tyranny. But our cosmopolitan elites take this to an extreme. They think because anyone can become an American, we’re morally obligated to treat everyone like an American. If you disagree, you’re considered hard-hearted, bigoted, intolerant, xenophobic. So the only policies that aren’t inherently un-American are those that effectively erase our borders and erase the distinction between citizen and foreigner: don’t erect barriers on the border; give sanctuary cities a pass; spare illegal immigrants from deportation; allow American businesses to import as much cheap labor as they want. Anything less, the elites say, is a betrayal of our ideals. But that’s wrong. Just because you can become an American doesn’t mean you are an American. And it certainly doesn’t mean we must treat you as an American, especially if you don’t play by our rules. After all, in our unique brand of nationalism, which connects our people through our ideas, repudiating our law is kind of like renouncing your blood ties in the monarchical lands of old. And what law is more fundamental to a political community than who gets to become a citizen, under what conditions, and when? While we wish our fellow man well, it’s only our fellow citizens to whom we have a duty and whose rights our government was created to protect. And among the highest obligations we owe to each other is to ensure that every working American can lead a dignified life. If you look across our history, I’d argue that’s always been the purpose of our immigration system: to create conditions in which normal, hard-working Americans can thrive. “To increase the wealth and strength of the community.” That’s quite a contrast to today’s elite consensus. Our immigration system shouldn’t exist to serve the interests of foreigners or wealthy Americans. No, it ought to benefit working Americans and serve the national interest—that’s the purpose of immigration and the theme of the story of American immigration. When open-borders enthusiasts tell that story, it sounds more like a fairy tale. The way they tell it, America at first was a land that accepted all comers without conditions. But then, periodically, the forces of nativism and bigotry reared their ugly head and placed restrictions on who could immigrate. The forces of darkness triumphed, by this telling, with the Johnson-Reed Act of 1924. But they were defeated with the passage of the Immigration and Nationality Act of 1965, which again opened our shores and is still the law governing our immigration system today. Since 1965, everyone has lived happily ever after. If I were to grade these storytellers, I would give them an F for history and an A for creative writing. The history of immigration in America is not one of ever-growing tides of huddled masses from the Pilgrims to today. On the contrary, throughout our history, American immigration has followed a surge-and-pause pattern. The first big wave was the Irish and German immigrants in the 1840s and 1850s. Then immigration tapered off during the Civil War. The second big wave was the central and southern European immigrants in the late 19th and early 20th centuries. That wave ended with the 1924 Act and the years of lower immigration that followed. And now we’re in the longest wave yet, the surge of immigration from Latin America and East and South Asia, which has followed from the 1965 Act. In this actual history—not the fairy tale history—the 1924 Act is not an aberration, but an ebb in the regular ebb and flow of immigration to America. After decades of unskilled mass immigration, that law responded by controlling future immigration flows. One result of lower levels of immigration was that it allowed those earlier immigrants to assimilate, learn new skills, and move up the economic ladder, creating the conditions for mass affluence in the post-war era. Now, there’s no denying that the story of American immigration has its uglier chapters: the Chinese Exclusion Act, the national-origins quota system imposed by the 1924 Act, the indifference to Jews in the 1930s. We ought to remember and learn from this history. One important lesson, though, is this: if the political class had heeded the concerns of working Americans during the second big wave, the 1924 Act would likely have passed earlier and been less restrictionist. The danger lies not in addressing the people’s legitimate, reasonable concerns about immigration, but in ignoring those concerns and slandering the people as bigots. The economy we’re living in today is in no small part a result of the 1965 Act, which opened the door to mass immigration of unskilled and low-skilled workers, primarily through unlimited family chain migration. And that’s not an economy anyone should be satisfied with. Today, we have about a million immigrants per year. That’s like adding the population of Montana every year—or the population of Arkansas every three years. But only one in 15—one in 15 of those millions of immigrants—comes here for employment-based reasons. The vast majority come here simply because they happen to be related to someone already here. That’s why, for example, we have more Somalia-born residents than Australia-born residents, even though Australia is nearly twice the size of Somalia and Australians are better prepared, as a general matter, to integrate and assimilate into the American way of life. In sum, over 36 million immigrants, or 94 percent of the total, have come to America over the last 50 years for reasons having nothing to do with employment. And that’s to say nothing of the over 24 million illegal immigrants who have come here. Put them together and you have 60 million immigrants, legal and illegal, who did not come to this country because of a job offer or because of their skills. That’s like adding almost the entire population of the United Kingdom. And this is still leaving aside the millions of temporary guest workers who we import every year into our country. Unlike many open-border zealots, I don’t believe the law of supply and demand is magically repealed for the labor markets. That means that our immigration system has been depressing wages for people who work with their hands and on their feet. Wages for Americans with high school diplomas are down two percent since the late 1970s. For Americans who didn’t finish high school, they’re down by a staggering 17 percent. Although immigration has a minimal effect overall on the wages of Americans, it has a severe negative effect on low-skilled workers, minorities, and even recent immigrants. Is automation to blame in part? Sure. Globalized trade? Yes, of course. But there’s no denying that a steady supply of cheap, unskilled labor has hurt working-class wages as well. Among those three factors, immigration policy is the one that we can control most easily for the benefit of American workers. Yet we’ve done the opposite. I know the response of open-border enthusiasts: they plead that we need a steady supply of cheap unskilled labor because there are “jobs that no American will do.” But that just isn’t so. There is no job Americans won’t do. In fact, there’s no industry in America in which the majority of workers are not natural-born Americans—not landscapers, not construction workers, not ski instructors, not lifeguards, not resort workers, not childcare workers—not a single job that over-educated elites associate with immigrants. The simple fact is, if the wage is decent and the employer obeys the law, Americans will do any job. And for tough, dangerous, and physically demanding jobs, maybe working folks do deserve a bit of a raise. “No American will do that job.” Let me just pause for a moment and confess how much I detest that sentiment. In addition to being ignorant of the economic facts, it’s insulting, condescending, and demeaning to our countrymen. Millions of Americans make our hotel beds and build our houses and clean our offices; imagine how they feel when they hear some pampered elite say no American will do their job. And finally, I must say, that sentiment also carries more than a whiff of the very prejudice of which they accuse those concerned about the effects of mass immigration. But the harmful impact on blue-collar workers isn’t the only problem with the current system. Because we give two-thirds of our green cards to relatives of people here, there are huge backlogs in the system. This forces highly talented immigrants to wait in line for years behind applicants whose only claim to naturalization is a random family connection to someone who happened to get here years ago. We therefore lose out on the very best talent coming into our country—the ultra-high-skilled immigrants who can come to America, stand on their own two feet, pay taxes, and through their entrepreneurial spirit and innovation create more and higher-paying jobs for our citizens. To put it simply, we have an immigration system that is badly failing Madison’s test of increasing the wealth and strength of the community. It might work to the advantage of a favored few, but not for the common good, and especially not the good of working-class Americans. This is why I’ve introduced legislation to fix our naturalization system. It’s called the RAISE Act: Reforming American Immigration for a Strong Economy. The RAISE Act will correct the flaws in the 1965 Act by reorienting our immigration system towards foreigners who have the most to contribute to our country. It would create a skills-based points system similar to Canada’s and Australia’s. Here’s how it would work. When people apply to immigrate, they’d be given an easy-to-calculate score, on a scale of 0 to 100, based on their education, age, job salary, investment ability, English-language skills, and any extraordinary achievements. Then, twice a year, the U.S. Citizenship and Immigration Services would invite the top scorers to complete their applications, and it would invite enough high-scoring applicants to fill the current 140,000 annual employment-based green-card slots. We’d still admit spouses and unmarried minor children of citizens and legal permanent residents. But we’d end the preferences for most extended and adult family members—no more unlimited chain migration. We’d also eliminate the so-called diversity visa lottery, which hands out green cards randomly without regard to skills or family connections, and which is plagued by fraud. We’d remove per-country caps on immigration, too, so that high-skilled applicants aren’t shut out of the process simply because of their country of origin. And finally, we’d cap the number of refugees offered permanent residency to 50,000 per year, in line with the recent average for the Bush era and most of the Obama era—and still quite generous. Given current events, this legislation is timelier than ever. Earlier this month, President Trump announced that he would wind down, over six months, the unconstitutional Deferred Action for Childhood Arrivals program, also known as DACA. President Obama abused his authority with DACA—which purported to give legal status to illegal immigrants who arrived here as children and who are now in their twenties and thirties—because, as we’ve seen, the Constitution reserves to Congress the power to make uniform laws of naturalization. Because of President Obama’s unlawful action, about 700,000 people are now in a kind of legal limbo. President Trump did the right thing as a matter of law by ending DACA, though as a matter of policy he’d prefer its beneficiaries don’t face deportation. Democrats agree, as do a lot of Republicans. So the question isn’t so much about deportation, but rather if and what kind of compromise Congress can strike. Here’s where the RAISE Act comes in. We can, if we choose, grant citizenship to those illegal immigrants who came here through no fault of their own as kids and who’ve otherwise been law-abiding, productive citizens. But if we do, it will have the effect of legalizing through chain migration their parents—the very people who created the problem by bringing the kids here illegally. Some like to say that children shouldn’t pay for the crimes of the parents, but surely parents can pay for the crimes of the parents. And that’s to say nothing of their siblings and spouses, and then all the second- and third-order chain migration those people create. So simply codifying DACA without ending chain migration would rapidly accelerate the wave of unskilled immigrant labor that’s been depressing the wages of working Americans. An obvious compromise, then, is to pair any attempt to codify DACA with reform of the green card system to protect American workers. A stand-alone amnesty will not do. Nor will an amnesty with vague promises of “border security,” which never seem to materialize or get funded once the pressure is off Congress. But if we codify DACA along with the reforms in the RAISE Act, we will protect working Americans from the worst consequences of President Obama’s irresponsible decision. President Trump has said that chain migration must be ended in any legislative compromise, and he’s highlighted the RAISE Act as a good starting point for those negotiations. I support that approach, and I’m committed to working with my colleagues, Democrats and Republicans alike, on a deal that protects American workers and strengthens our community. Immigration has emerged in recent years as a kind of acid test for our leaders—a test they’ve mostly failed. Our cosmopolitan elite—in both parties—has pursued a radical immigration policy that’s inconsistent with our history and our political tradition. They’ve celebrated the American idea, yet undermined the actual American people of the here and now. They’ve forgotten that the Declaration speaks of “one people” and the Constitution of “We the People.” At the same time, they’ve enriched themselves and improved their quality of life, while creating a new class of forgotten men. There’s probably no issue that calls more for an “America first” approach than immigration. After all, the guidepost of our immigration policy should be putting Americans first—not foreigners and not a tiny elite. Our immigration policy should serve the “wealth and strength” of our people, as Madison said in that first Congress. It should not divide our nation, impoverish our workers, or promote hyphenated Americanism. Citizenship is the most cherished thing our nation can bestow. Our governing class ought to treat it as something special. We ought to put the interests of our citizens first and welcome those foreigners best prepared to handle the duties of citizenship and contribute positively to our country. When we do, our fellow Americans will begin to trust us once again.